You may remember a few years ago, I reviewed the nuNAAT Real Me Curl-to-Coil Collection. My review of this collection was my introduction to nuNAAT and the company has been on my radar ever since. 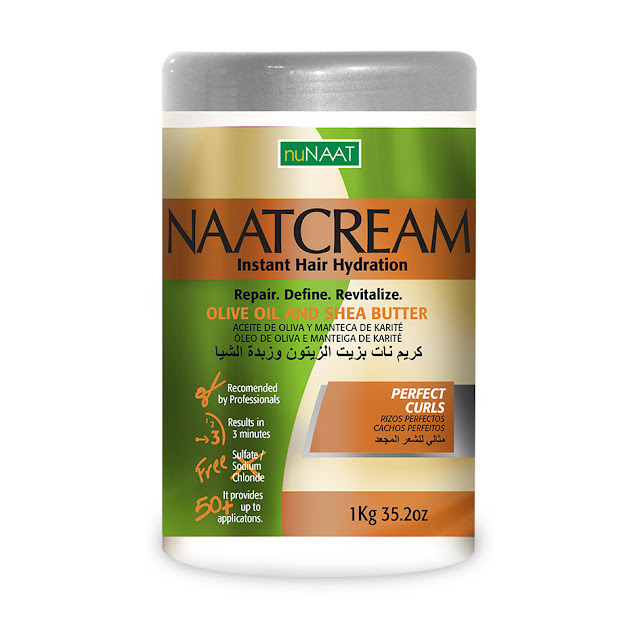 Since I had such a great experience with the Real Me Curl-to-Coil Collection, I was more than happy to try a new product when nuNAAT recently reached out to me. 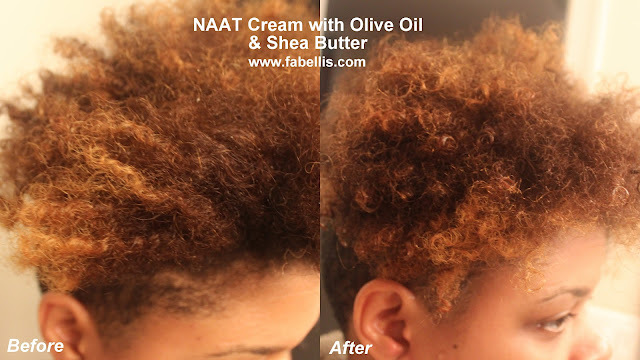 Today I'll be giving you the low down on the NAAT Cream with Olive Oil and Shea Butter. Their 32.5oz bottle will definitely give you your money’s worth for under $6, they should last about a month or more. The Olive Oil in the NAAT Cream with Olive Oil and Shea Butter is as good for your hair and skin as it is for your health. With rich amounts of vitamins A and E, minerals and antioxidants, olive oil helps defend against hair loss. With regular use, you hair will be shiny, silky and lustrous. The SHEA BUTTER (KARITÉ) is a slightly yellowish or ivory-colored natural fat extracted from the fruit of the Shea tree found in Africa. Shea butter is one of the richest emollients on the market, providing ultraviolet protection without a greasy feeling. Cetearyl Alcohol, Zea Mays (Corn) Starch, Cetrimonium Chloride, Alcohol, PARAFFINUM LIQUIDUM/MINERAL OIL Grade USP, free from carcinogenic substances, Parfum (Fragrance), Butyrospermum parkii, (Shea) Butter Extract, Olea Europaea (Olive) Fruit Oil, Citric acid, Methylchloroisothiazolinone, CI 19140 (Yellow 5), Methylisothiazolinone, CI 14700 ( Red 4), CI 42090, Aqua (Water). When I first received the NAAT Cream with Olive Oil and Shea Butter in the mail, I was blown away by how large the container was. It's extremely rare to find a 32.5 ounce bottle for under $6! I opened the cream and fell in love with the smell. If you're like I was, you may be wondering what the cream is exactly used for. This multipurpose cream can be used as conditioner, a deep conditioner or even used daily to add moisture to your hair. I chose to use the cream as a conditioner and deep conditioner for my hair. When I applied it to my hair, my scalp and hair strands were absolutely loving it. It smelled great and made my hair extremely smooth and soft upon application. When I rinsed my hair, my hair felt so soft and I knew detangling would be a breeze. What I didn't expect was slight itchiness around my hairline and scalp a few moments after rinsing my hair. Considering how great my hair felt with the product on, the itchiness surprised me. I decided to take a look at the ingredients in the NAAT Cream with Olive Oil and Shea Butter. I soon found that two of the ingredients were alcohol and fragrance. My skin is very sensitive to both ingredients. I also noticed that not long after rinsing my hair, as my hair began to dry, it was extremely dry and no longer felt moisturized and soft like before. This may have been an effect of the alcohol. Maybe. As I mentioned before, my scalp is very sensitive to alcohol and fragrance. However, beauty products work differently for everyone. If you are not allergic to these ingredients, this might be a great conditioner for you. Would you give the NAAT Cream with Olive Oil and Shea Butter a try? Product was provided for review purposes. All thoughts are my own.